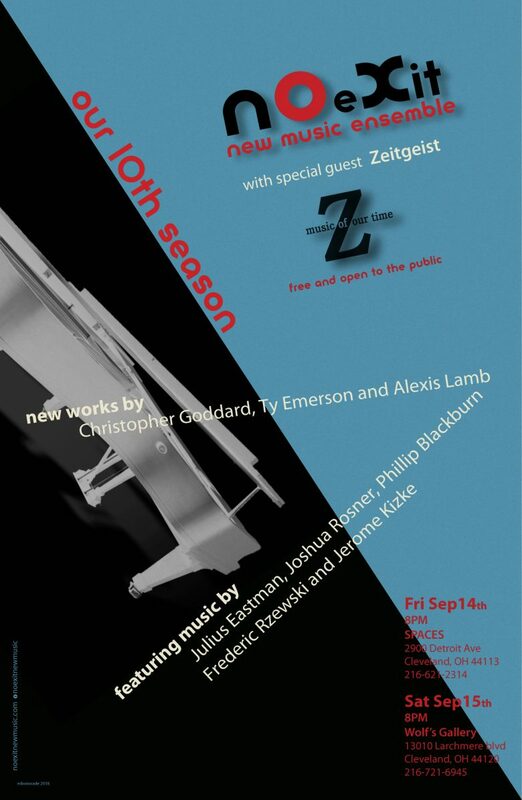 What better way for No Exit to kick off their tenth season of concerts than by sharing a stage with the always amazing Zeitgeist (from St. Paul, Minnesota) surrounded by exquisite art at WOLFS Gallery! Please join us at WOLFS for an evening of art, cocktails, h’orderves and of course, music. The program will feature world premiere works by Christopher Goddard, Alexis Lamb and Cleveland-based composer Ty Emerson. Also on the program will be music by Frederic Rzewski and Philip Blackburn. Free valet parking will be available. This is going to be a wonderful evening folks so don’t miss it! Free and open to the public.